"We are certainly the collective voice of the profession in Massachusetts. And this year we will be dealing with those things that relate to our core mission and values - issues of administration of justice and access to justice." "I can see the headline in the Herald now … 'Lawyers Don't Know What They're Doing'," joked MBA Vice President John Dugan as be began his portion of a mini-debate on the question of whether to set a definition of the practice of law that was the centerpiece of the Sept. 25 House of Delegates meeting. 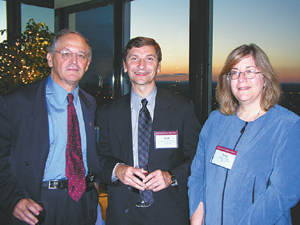 Among the guests who enjoyed the view and the conversation at the annual President's Reception, Sept. 30 at the Top of the Hub in the Prudential Center, were: Middlesex Juvenile Court Judge Jay D. Blitzman with MBA President Richard C. Van Nostrand, center, and MBA Executive Director Abigail Shaine. A western Massachusetts woman unjustly laid off from her job recently obtained a large judgment against her employer following an intense legal battle that began with a simple call for help to the MBA's Lawyer Referral Service.